Savannah Shaughnessy never wades in without a plan. Whether she's choosing what type of biology to study at UC Santa Cruz--ecological or cellular?--or pondering whether to huck herself over the ledge of a 40-foot wave, Shaughnessy is nothing if not calculated. That's why her first paddle out to the legendary big-wave break known as Mavericks at age 16 led her away from the monster waves and back to the safety of dry land. And the drawing board. "I didn't have a plan that day," she confesses. The whole phenomenon that is Mavericks intimidated her--the crowd, the vibe and, most of all, the deafening boom created when building-size slabs of water collapse into themselves. For the shy Scotts Valley teen, the experience was a visceral nonstarter. She paddled back to shore, she said, "and I didn't go back for a long time." Two years, to be exact. After all, the scientific method requires data collection, observation, and experimentation. For Shaughnessy, there was still much research to be conducted. Before there could be a Savannah Shaughnessy there had to be a Sarah Gerhardt. 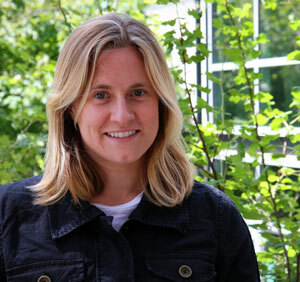 The 34-year-old UCSC Ph.D. in physical chemistry is the reason why Shaughnessy, now 20, and other young females like her would even dream of entering the testosterone-soaked world of big-wave surfing. She's also the one who paddled out with Shaughnessy at Mavericks the day the wide-eyed youngster opted only to spectate. The two met when Shaughnessy was a landlocked middle schooler bumming rides down Highway 17 to revel in her new passion. At that point Shaughnessy was a good soccer player, but she knew next to nothing about the rich surf culture just a few miles to the west. "We weren't a beach family whatsoever," she said. "We didn't have a clue. When we did come down, we were just like all the tourists." Soon she had a poster of local big-wave icon Peter Mel adorning her wall. Then she saw video footage of some of the biggest waves ever ridden at Mavericks. When she learned about Gerhardt and her exploits, she knew she'd found her calling. "I believed that she was serious about surfing Mavs because I would see her out at Steamer Lane on bigger days when hardly anyone else would go out," Gerhardt said. "I noticed that Savannah would position herself in the lineup to catch waves and possibly get hammered by them, too. She wasn't just sitting on the shoulder, scared." Fortunately for Shaughnessy, Gerhardt would prove to be a pretty good role model and mentor outside of the water too. When Shaughnessy enrolled in introductory chemistry at Cabrillo College, a community college in Aptos, the teacher at the front of the classroom provided a familiar, calming presence. It was Gerhardt. Gerhardt became the first woman to surf Mavericks in 1999. The Morro Bay native began her pioneering path while spending time in Hawaii during breaks from studying for a chemistry degree at Cal Poly San Luis Obispo. Like Shaughnessy now, Gerhardt faced the tricky balance of pursuing a challenging academic course and putting in the time to conquer big waves. In fact, the mother of two young children still does that now, having returned to her postdoctoral studies at UCSC at the Noller Lab. "When I see Savannah it's like looking at myself 15 years ago when I was an undergrad and surfing big Hawaii," Gerhardt said. "She is smart, and also happens to surf big waves. The crew at Mavs is just like that. There are doctors, lawyers, scientists." Though Shaughnessy only surfed Mavericks a half dozen times this past winter (choosing class at UCSC over surfing on numerous occasions), she parlayed two great sessions in January and February into surf world fame. Her good friend, Santa Cruz photographer Nikki Brooks, was shooting pictures from the water on both days. 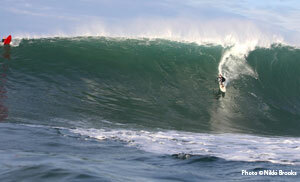 The result was a nomination for a Billabong XXL award--surfing's equivalent of an Oscar nomination. Though the women's XXL award went to experienced Brazilian charger Maya Gabeira, Shaughnessy's arrival has not gone unnoticed. Even her idol Peter Mel recently dropped Shaughnessy's name when asked about the most impressive things he had seen that winter. The junior big-wave scientist is on her way. After finishing her final semester in the fall doing field study in Corsica, France, Shaughnessy will ponder further academic paths in biology or forensic science. But like her mentor, she won't stray too far from the coast. And surely thoughtful research will always be part of Shaughnessy's equation. "Mavericks is the ultimate challenge for me," she said. "I just want to keep learning and pushing myself to get better. That's my plan."